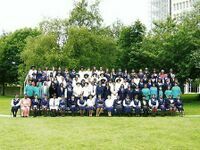 The Girls' Brigade is an international and interdenominational Christian youth organization. It was founded in 1893 in Dublin, Ireland. The modern organization was formed as the result of the amalgamation of three like-minded and similarly structured organizations in 1964. These organizations were the Girls' Brigade of Ireland (1893), the Girls' Guildry of Scotland (1900), and the Girls' Life Brigade of England (1902). The International Headquarters are currently based in Glasgow. The organization operates in over 60 countries worldwide and is divided into five Fellowships: African, Asian, Caribbean and Americas, European, and Pacific. International Conferences are held every four years, this has been happening since 1998 when the conference was in Australia. It was in Thailand in 2002 and Northern Ireland in 2006. The Queen Mother and Princess Alice were Girls' Brigade's patrons until their deaths in 2002 and 2004 respectively. There are, at the moment, no living patrons. The motto of the Girls' Brigade is "Seek, Serve and Follow Christ" and its Aim is "To help girls become followers of the Lord Jesus Christ, and through self control, reverence and a sense of responsibility to find true enrichment of life". 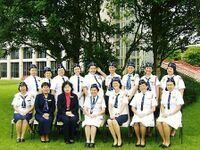 Because of the youth development aspect of its work, the Girls' Brigade is a member of The National Council for Voluntary Youth Services (NCVYS) and has been since 1936, when it was one of NCVYS's founding organisations. The GB programme follows four themes: Spiritual, Physical, Educational and Service. These words spell SPES which is Latin for Hope. It was said that each girl in Girls' Brigade was a hope for the future. Also the girls are encouraged to participate in activities other than just badge work. These include leadership courses for 14–21 year olds, and most companies or districts arrange camps or holidays, usually one per year. Moreover, GB helps its members with the Duke of Edinburgh Award scheme. 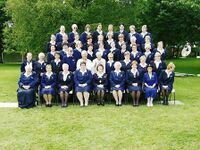 The most recent project that Girls' Brigade England & Wales has undertaken is "Arise". This project involves many different events such as roadshows etc. Arise is often quoted as standing for: Activities, Resources, Ideas, Support and Equipping. These mean that the children will be able to attend activity days to learn about Jesus and meet up with other GB members, they will also have resources adapted to meet the specific child's needs. Moreover, the ideas for activities will be new and made in a better way to encourage children, as well as supporting children with their work and helping to set up further youth groups. And the final idea of Arise is to train people to work with children so they are equipped for anything the children may do. Premier Radio helped to promote Arise on their radio shows. Arise is a joint project with Viz-A-Viz Ministries. Girls cannot carry onto the next section of Young Leaders Training without completing the previous section. They may however start at a slightly older age. 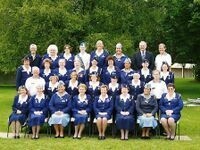 However if someone joins Girls' Brigade later in life and has not previously participated in Girls' Brigade they can complete Officer Training in order to gain Leader status. As of 31 March 2005, there were 6,109 Explorers, 7,534 Juniors, 4,016 Seniors, 1,913 Brigaders, 405 Warrant Officers, 124 Supernumary Officers, 1,967 Officers in 707 Companies within England & Wales. All Officers are now called Leaders. The crest is a registered trade mark of Girls' Brigade England & Wales. However, all Girls' Brigade companies around the world have the right to use it. In the centre is a Cross, the symbol of Christ and his Church. Below the cross is a Lamp, which represents the light of the Girls' Brigade shining upon the World. Above it is a Crown, of Christ as King. Behind it all, is a Torch, the flame of Christ's living spirit. The badge incorporates symbols from the three original organizations and is, therefore, in itself a symbol of union, as well as faith and allegiance to the Lord Jesus Christ. The Girls Brigade which formed in Ireland in 1893, brought in the Cross. The Girls' Guildry which formed in 1900 in Scotland, brought in the Lamp. Lastly, the Girls' Life Brigade, which formed in 1902 in England, brought in the Crown. They amalgamated in 1964. A competition was held to design the crest for the amalgamated organisation, it was won by Constance Fasham. 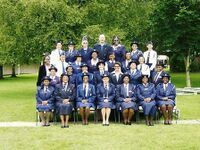 The International President of the Girls' Brigade is Mrs. Ruth Chikasa from Zambia. The International Treasurer is Ms. Joyce Evans of England and Wales. The International Vice-Presidents are the Chairmen from each Fellowship. Bridget Leher (Zimbabwe) is the Fellowship Chairman. Sally Chew (Singapore) is the Fellowship Chairman. Andrea Stevens (Cayman Islands) is the Fellowship Chairman. Vivienne Aitchison (England and Wales) is the Fellowship Chairman. |} Note: Currently England & Wales run as one country for Girls' Brigade even though they are distinct countries. Jennifer Box (New Zealand) is the Fellowship Chairman. ↑ "About GB". http://www.girlsbrigadeew.org.uk/html/about_gb.html. Retrieved 2007-03-13. ↑ 2.0 2.1 "History of GB & info on International Conferences". http://www.gbic.org/History.htm. Retrieved 2007-03-13. ↑ "Address of HQ". http://64.233.183.104/search?q=cache:z7YsO4TMXOYJ:www.girlsbrigadeew.org.uk/International_Annual_Report.doc+girls+brigade+headquarters+international+glasgow&hl=en&ct=clnk&cd=4&gl=uk. Retrieved 2007-03-13. ↑ 4.0 4.1 "International GB". http://www.girlsbrigadeew.org.uk/html/international.html. Retrieved 2007-03-13. ↑ "Newsletter mentioning where the 2006 ICGB conference was held" (PDF). http://www.girlsbrigadeew.org.uk/International_Newsletter_Dec_2006.pdf. Retrieved 2007-03-13. ↑ "Patrons of GB". http://www.girlsbrigadeew.org.uk/html/office_bearers.html. Retrieved 2007-03-13. ↑ "Information on principles". http://www.hants.gov.uk/youth/girlsbrigade-solent/principl.html. Retrieved 2007-03-13. ↑ "Information on motto and aim". http://www.hants.gov.uk/youth/girlsbrigade-solent/aim.html. Retrieved 2007-03-13. ↑ "Further part of the GB proramme". http://www.hants.gov.uk/youth/girlsbrigade-solent/program.html. Retrieved 2007-03-13. ↑ "All information about Arise". http://www.girlsbrigadeew.org.uk/html/arise.html. Retrieved 2007-03-13. ↑ "Premier Radio and Arise". http://www.premier.org.uk/engine.cfm?i=674&bhcp=1. Retrieved 2007-03-13. ↑ "Viz-A-Viz Ministries partnership page". http://www.vizaviz.org/arisepartnership.htm. Retrieved 2007-03-13. ↑ "Explorer's Section on GBEW". http://www.girlsbrigadeew.org.uk/html/explorers.html. Retrieved 2007-03-13. ↑ "Junior's Section on GBEW". http://www.girlsbrigadeew.org.uk/html/juniors.html. Retrieved 2007-03-13. ↑ "Brigader's Section on GBEW". http://www.girlsbrigadeew.org.uk/html/brigaders.html. Retrieved 2007-03-13. ↑ "Information on all three stages of young leader training". http://www.girlsbrigadeew.org.uk/html/yl_training.html. Retrieved 2007-03-13. ↑ "Information on becoming a Leader of GB". http://www.girls-brigade-scotland.org.uk/Leader_Officer.htm. Retrieved 2007-03-13. ↑ "Statistics of 2005 Members of GB". http://www.girlsbrigadeew.org.uk/_7__stats0405.xls. Retrieved 2007-03-13. ↑ "Anuual Report 2004". http://www.google.com/search?q=cache:z7YsO4TMXOYJ:www.girlsbrigadeew.org.uk/International_Annual_Report.doc+girls+brigade+doc&hl=en&ct=clnk&cd=3&gl=uk. Retrieved 2007-03-13. ↑ "Information on African Fellowship". http://www.girlsbrigadeew.org.uk/html/int_africa.html. Retrieved 2007-03-13. ↑ "Information on Asian Fellowship". http://www.girlsbrigadeew.org.uk/html/int_asia.html. Retrieved 2007-03-13. ↑ "Information on Caribbean & Americas Fellowship". http://www.girlsbrigadeew.org.uk/html/int_americas.html. Retrieved 2007-03-13. ↑ "Information on Europe Fellowship". http://www.girlsbrigadeew.org.uk/html/int_europe.html. Retrieved 2007-03-13. ↑ "Information on Pacific Fellowship". http://www.girlsbrigadeew.org.uk/html/int_pacific.html. Retrieved 2007-03-13. This page was last edited on 8 January 2014, at 14:41.